For the last 24 hours I have been stuffing clothes into suitcases. I am doing my best to prime the dog, but am hampered because he doesn’t speak English. He looks at me as I try to explain that his forest will be soon exchanged for a beach, and in best Far side tradition hears:”Blahblahblahblahblah”. The children have put together a capsule toy collection and every one of my precious gadgets and their chargers is about to be packed up and shipped out. These days we have cars and wheelie vinyl suitcases. I look at the travelling trunks of old, and I pale. To haul such huge wooden boxes around must have made travelling such a huge undertaking. Unless you were a king, of course. In May of 1520, Henry VIII and his entourage packed up their trunks and set out from his palace at Greenwich to travel down to Dover. Henry’s destination: Guisnes. Parley with the French King. Field of The Cloth of Gold. Travelling was not simple. Royal officers would ride ahead to great houses on the route to check provisions and find billets for the less fortunate ‘outer entourage’ in local inns and houses; and then the officers of the Wardrobes and Beds would move in, packing plate, beds, tapestries and clothes. And as they travelled, the King’s business must continue. The flurry of letters winging their way back and forth as Henry’s people made their way towards Dover is just fabulous. These are voices from 1520, talking about the stuff we read in history books from a ringside seat. You can read them here: gems from the bustle already going on in France. The bill for the gold cloth alone is compulsive reading. Dover Castle was their last stop before getting on the boats for France. And hanging in Hampton Court Palace is the most stunning document of the superhuman effort it must have taken to get the English Court across the sea. It’s called “The Embarcation at Dover”. The name of the artist is lost in time, which is a shame, because if you stand in front of it you can feel the brine in the air and the wind tugging at your clothes. Internet representations do it scant justice. The choppy sea, those great ships prepared to carry the king and his court across the sea, details where courtiers hob-nob, people scrambling onto the ships from smaller craft: I can almost hear it, it is so very vivid. It was painted 24 years later, with licence: ships this big could never have got into this harbour at this time. But it captures the excitement of setting out. Behind them, Henry’s Dover stronghold on the hill. In front of them: adventure. Which is what we Shrewsdays always find, when we travel down to the same place for our holidays. We’ll see the castle and stand on the harbour with the wind in our hair. Those great Tudor ships will be exchanged for huge white ferries and all the other craft which use this incredible marine gateway. Of course, Henry would turn in his capacious vault if he saw the proposals to sell the harbour to the French. Posted in Quirks of History, Shrewsday MansionsTagged Dover, Embarcation at Dover, england, Hampton Court Palace, harbour, Henry VIII, history, tudor shipsBookmark the permalink. I bet Henry did not himself pack a single trunk. I love that picture, the curly sea so lively in making the whole enterprise rather difficult. Have you ever been seasick on the English Channel? MIserable, but short lived. Have a great holiday. Totally engrossed in the details of the painting. It’s the sort of painting my husband would want on the back of the lavatory door, Roger. Though it’s possible that’s too much information. Ships ahoy! Kate and family – have a great time. Thanks, Rosemary. Looking out on a choppy Channel right now. Wonderful painting, so much going on. Have a wonderful vacation and looking forward to some beach pics. Well at least you don’t haul around all your silver plate in a great big trunk! Thanks Kate – I’ll nurse the hangover by looking through these letters! Pingback: Weekend Rounup: August 19-25 « Neither Here nor There…. That roiling sea resurfaces a very unpleasant time aboard a glass-bottomed boat in Key Largo. I hope you and your family have a very enjoyable holiday. BTW, they say dogs really can pick up on our body language. So it’s likely he does know what excitement he’s in for. He does now, Judy – he’s staring at the sea, sniffing the brine in the air. 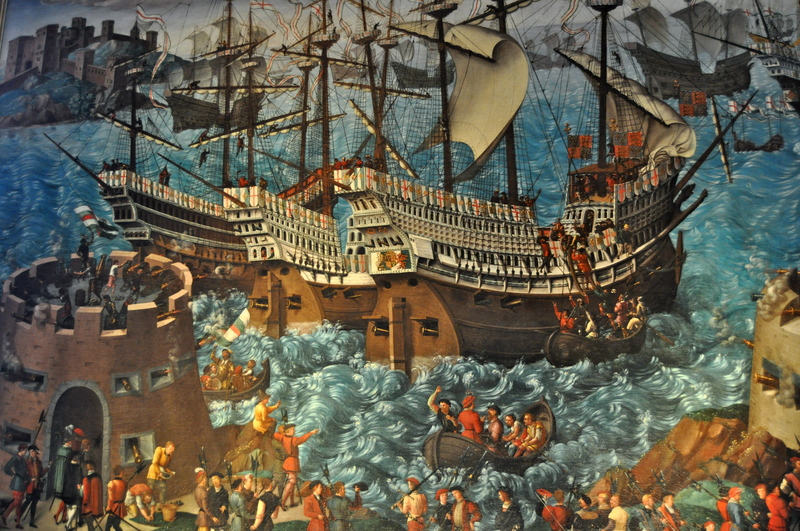 Lively detail in the painting, indeed, but I somehow think the artist was not clued up on matters maritime. Two sails set, and theyre still taking on passengers, for example. At least he doesn’t have the wind coming from several different directions at the same time, as some do. I hope proper packing of Macauley’s pet things was done. It is lovely to have a nautical take on it, Col. No-one knows who the artist was. I wonder. Enjoy the salty scent of the sea, Kate! *GASP* Sell the White Cliffs of Dover? How did I miss that one. I take they didn’t go through wit hit, as I only seen articles regarding the subject from 2010. I have an antipathy to that bully Henry VIII. Especially as he just so reminds of a bullying headteacher (now deceased) I once had. Like the Tudor king he was tall and formerly sporty (an ex-rugby player in his youth), interested in theology (he had a PhD in it) but quite unchristian in his relationships with staff, and boasted a Welsh connection (which seemed to result in a kind of reverse snobbery towards anyone whom he regarded as educated and English). You’ll gather we didn’t get on. They’re dramatising Dissolution on Radio 4 next week, I hear. Though it’s never quite the same as reading his words. Oh, I’ll listen out for that. Especially if I’m driving! I get all jittery just thinking of packing up for a short trip, let alone a choppy channel voyage. I always pack too much, wherever I go. Right now, I’m preparing for a trip up north to see Kezzie with a departure date still up in the air – and have to figure out how to get a rocking chair into the car. Sigh. That will be a story for a post. In the meantime, safe travel, and thanks for this grand post. Penny, you make me laugh: I remember going to fetch a rocking chair for Maddie when she was a newborn. She loved being rocked. There she was in the baby seat , and the hatchback behind tied down to make safe a huge chair. Hope all goes well with your plans to see that lovely granddaughter of yours. Have a wonderful time, Kate, say hi to the white cliffs for me! Thanks! I’m waving at them now for you through a rain-smattered picture window! I hope your holiday is the perfect break, Kate. How could it not be when you are sitting in the midst of so much history? Another place for my list. What detail went into making that work of art. It is one picture I would have on my wall if I could, Andra.